70% of laptop theft involves a former employee or contractor. EXO5 is proven defense against insider theft. Everything you need to run a more secure laptop fleet. with data privacy standards. All with a single cloud-based console. 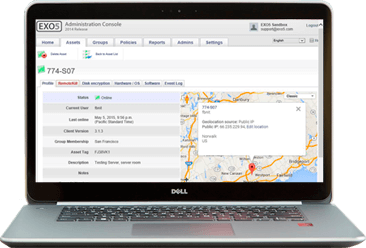 Track and locate laptops, smartphones and tablets across your organization in real-time. Prevent asset theft and data breaches with anti-theft countermeasures including hard drive lockout, out-of-band file encryption, and full disk encryption PIN revocation. Deploy and manage Windows Bitlocker and Mac OS X Filevault. Stay compliant with data privacy standards using industry-standard OS-native encryption. Protect smartphones and tablets and address BYOD with ease. Make better decisions with real-time asset inventory and powerful reporting capabilities.